People born in the Chinese astrological Year of the Monkey are thought to be treated to the gift of great wit. When these individuals also have the Western influence of Leo in their birth sign, they are believed to receive an extra-large sense of the Monkey's humor. These personalities seem to find lots of things comical and always appear to be smiling. The mischievous fun-loving Monkey presence really loosens up the sometimes overly serious Lion. This mix of character traits creates people who have a very cheery disposition and have an ability to reflect their cheerfulness. A Leo Monkey personality is usually bursting with energy, enthusiasm, sociability and charm. They are usually quick thinkers who are decisive and can also be quite persuasive in their manner. These characters are not shy of hard work and enjoy the company of others around them, most of the time. 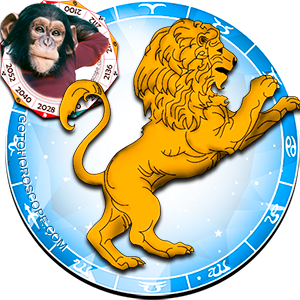 The Leo Monkey is optimistic and direct in his or her approach to life and in their dealings with others. They are generous and kind like the Monkey, and protective and reliable akin to the Lion, and will normally make very supportive partners. In relationships, they take commitments and responsibilities rather seriously and can be deeply wounded by betrayal. The Leo Monkey has a dependable and confident air, but is neither bossy nor mean-spirited. These are strong personalities who usually easily acquire their own way, but they do not present themselves as forceful or aggressive. A Leo with Monkey influences will use his communication skills and wittiness to win people over. These people are usually really skilled at making others see the funny side of life. They often do well in advisory or counseling roles, as their humorous but sensible personality is perfect for communicating and helping people relax. Of all Leos this type is one of the most lovable and communicative of them all. These individuals are ambitious, and many of them will be inclined towards self-employment or achieving promotion in their work life. A Leo Monkey has a wonderful imagination and a love of the arts and music. They tend to have lots of different interests, enjoying creative hobbies, gardening, cooking or anything that produces nice things. Leo Monkeys are drawn to anything different or intriguing, as they are inquisitive and like to keep up to date on the latest gadgets. They can soon grow bored of things and always seem to be on the lookout for something new to focus their leisure time on. Weak spots in the Leo Monkey�s sprightly personality sometimes appear when he or she gets too curious about something. If a Leo Monkey feels they are being kept in the dark about something and left out they can get very annoyed and upset. They have a tendency to greatly dislike being excluded from anything. These individual's main weakness is that they are naturally nosy. They cannot help investigating, and their immense nosiness can frequently be misconstrued as interfering. These Leos often get less inquisitorial as they get older. Let's all be friends! I feel like we could be the best of friends with this personality. I totally agree on this one guys. I love making jokes on the daily. I love people. I have a ton of interests ane hobbies because I enjoy learning. I've thought of becoming a counsellor because I'm more cool headed than most Leos I've met.I feel I can be very understanding which could also be a bad thing at times. I can be nosy and I don't know how to stop it, so yes, that is my biggest weakness, but I would never show that I am a nosy person because I dispise gossip. I'm always looking out for others. If I gossip, I'll lose friends which I'll hate. I am nosy in other ways as well, but it's always to learn and pass on good things to others. I'm not bossy, but I am suggestive in a cool way. People describe me as a happy go lucky person. I'm pretty funny and I'm not really that social but I do hate being left out. Leo monkey ooh ooh ah rawer! This is me exactly, except for the nosy part. I'm very respectful of other people's personal space. I've also got Taurus rising and Scorpio moon, so you could probably guess that even though I get bored of things, I'm still quite capable of seeing them through to the end. I can also have my quiet moments even though I like talking to people. Definitely me about 98% only bec of my upbringing 2% less. (Haha). I really get bored of same activities and I really want to know what's up and be in the loop. I've been waiting for 2016 for a LONG time. I finally get everything aligned since my birth and once again, I am a LEO FIRE MONKEY. Hear me roar, or is that watch me peel bananas!? What are they talking about over there in that corner,it's me I know it! I need to find out, maybe it's something I should know, or something I could help out with, why aren't they telling me, why?!? It must be about me then since they haven't told me, and it's not good.... I know it....Sound familiar anyone? Ok seriously, besides that minor aside issue, I recommend all my fellow Leo/Monkeys read a book by Susan White called The New Astrology,you can find it on Amazon it's not too expensive, and if you're like me, which you are, you'll enjoy it. I first read it about 15 years ago, it provides much more than this description does, like the fact that we call/text or at least wonder where our significant others are all the time. Personally, I think we're probably one of the best sign combinations out there, but I'm a little bias. I am sitting here LMAO. So so true! Exactly! I always thought his behavior was sociopathic, which I suppose it still is... He makes more sense to me now. I think am a leo monkey guy and i think i enjoy every characteristic about this sign.